Yesterday, I did a make & take at the store. This was actually planned for last Saturday, but the store was closed in the morning because of the tsunami watch. 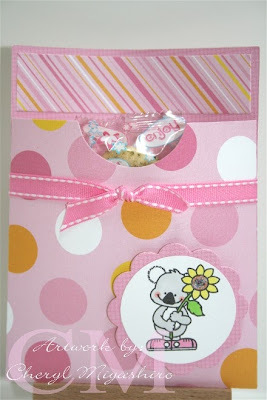 We used the Sizzix Big Shot Pro machine to make this pocket card holder. It is a 12x12 die and I thought it would be nice to let everyone try out this new machine. The scallop circle is on one of the A6 card dies but you can also buy it separate. It is one of the movers and shapers die. I couldn't decide which Pebbles paper to use so I gave everyone a choice of polka dots or stripes. And polka dots was the favored paper to use. We used Quincy from Dandelion Designs for the stamped image. He's such a cutie! And instead of putting a card in the pocket, I gave everyone nori rice crackers to put in the pocket. Well, I'm off to craft with some ladies today and hope you're having a wonderful weekend! I love this project Cheryl, it's so versatile! I think I'd like to try this. Such a cute holder!!! Love the "pink", wish I could have been there. what a cute pocket card. this turned out so sweet and I do love the pink paper you used. what a cute creation! have a great week! Love these pockets! 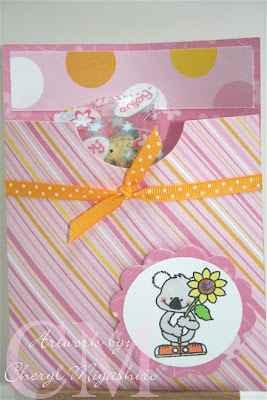 Such a cute treat holder and I love the pink and the cute DD image! !